For many, owning or renting a lake front home is a dream come true. This is certainly the case for anyone owning or renting property on Watchic Lake. Longer term residents are familiar with the routines of enjoying and maintaining their Watchic Lake property. Newer residents however often ask for guidance… with their experiences in mind the following is designed to help new members of the Watchic Lake community. Many commonly asked questions are answered on our FAQ page. The WLA helps maintain the lake for your enjoyment. They are also available for all kinds of advice and guidance on everything to do with enjoying your stay on the lake and maintaining your property. A vibrant and active lake association not only increases your enjoyment, but increases the desirability of Watchic Lake property, and thus your home’s value. For more information about the WLA and to join visit the Membership Overview section of this site. 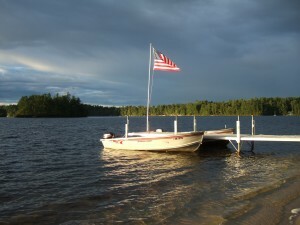 Many Watchic Lake properties have docks and/or floats used for swimming, canoe/boat mooring etc. In order to avoid ice damage, its important to remove your dock and float from the lake for the winter. This is best done before the dam is opened and the water level is higher, and by state law by November 1st. This is often done by the property owner, but local companies such as Seasonal Solutions can do this work as well. Non-motorized craft are welcome to launch from the Kiwanis Beach. Property owners generally launch their own motorized and non-motorized craft from their own or a neighbors’ property. As a reminder, any boats, canoes, kayaks, and trailers need to be clean and free of any plant life. Milfoil can live out of water for a week or more. Please help us keep our lake free of invasive aquatic plant life. Check out this guide to invasive species from the Maine Volunteer Lake Monitors. State law requires that motor boats and jet skis be used more than 200 feet from shore, give wide berth to non-motorized watercraft (kayaks, canoes, etc), and avoid the area near Kiwanis Beach (west side of lake). We ask that people avoid prolonged circling, racing, etc in one area. Its important to remove your boat from the lake before winter arrives in order to avoid damage to the boat. Its advised that boats are removed from the lake BEFORE the dam is opened in mid-October. Boats can be stored on your own property or local boat yards. Plan to put your boat back into the lake a few weeks after the dam has been closed… generally late-April to early-May. There is no town pick-up of trash in Standish. Instead, take your trash to the Standish Transfer Station (about 5 miles from the lake). The stations is open 7:30 a.m. – 4:30 p.m. Friday through Monday (closed Tuesday, Wednesday, and Thursday) and closed Memorial Day, Labor Day, Thanksgiving, Christmas, and New Years Day. The annual fee is $25. See Standish Transfer Station for the latest information. Lakescaping first assesses the lake front growing environment and then selects native plants that grow best in that environment, with the goal of reducing harmful runoff. Ideally the plants thrive in your specific soils, moisture, and light conditions and do not require supplemental water, fertilizer, pesticides or excessive labor to maintain. Laurel Jackson, Water Resources Specialist at the Portland Water District has lots of great information and suggestions on how Watchic Lake property owners can “lakescape” to help improve water quality, and improve your enjoyment of your property. Check out Laurel’s Lakescaping presentation to learn more! Standish has a leash law and your pets should be under your control at all times. Yes ducks… please do not feed them as this encourages them to congregate on the lake, causing “swimmer’s itch” and e-coli contamination of the lake. Hannaford Helps the WLA – Again!